Air quality affects all communities in a multitude of ways. Air pollution can harm the environment, damage property, diminish agricultural production, and reduce visibility. As a community, clean air is vital to overall Tribal health and welfare, to the local economies and ecosystems, and to the aesthetic beauty and quality of life enjoyed by everyone. Why should you be concerned about air pollution? Air pollution can make you sick. It can cause burning eyes, nose and an itchy, irritated throat, as well as trouble breathing. Some chemicals found in polluted air cause cancer, birth defects, brain and nerve damage, and long-term injury to the lungs and breathing passages. Some air pollutants are so dangerous that accidental releases can cause serious injury or even death. Air pollution can damage the environment. Air pollutants can thin the protective ozone layer above the Earth; this loss of ozone could cause changes in the environment as well as more skin cancer and cataracts (eye damage) in people. To see more information about air pollution and other air information, please visit the www.airnow.gov link. The following sections which go into more detail about each aspect of our air quality program. Recent studies indicate particulate matter (PM 2.5) and ozone in ambient air have health effects on the respiratory system and can lead to heart diseases. Major sources of particulate matter are motor vehicles, power plants and wood-burning stoves. 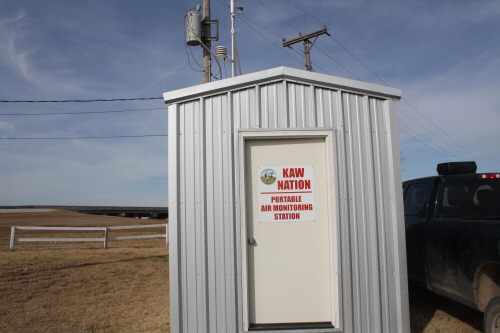 Because of these health impacts, the KNED installed a PM 2.5 air monitor at the Kanza Travel Plaza in Braman, Okla. All the information on the quantity and concentrate of the pollutants are transmitted electronically to the KNED office in Kaw City. After the data is analyzed and refined, it is submitted to the U.S. EPA Air Quality Service to be shared among state and federal agencies. A major component of our Air Program at the moment is the Emission Inventory. An emission inventory is the collection of emission by process for facitlies in the area. 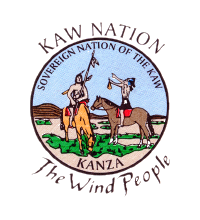 We conducted an emission inventory for a 50 miles radius of Kaw City. The reason we conducted this emissions inventory was to determine if the amount of emissions being emitted was having a diverse effect on peoples’ health. The main health concerns we were looking for were Upper Respiratory, Heart Disease, and Cancer. We conducted an emission inventory in 2002 and solicited information from our clinic on the number of Upper Respiratoy problems that had been reported for that year. So for the current emission inventory year (2007), we did the same thing. By repeating this same process we could compare the amount of emission each faciltiy is producing and also compare the number of cases of Upper Respiratory problems that were reported to the clinic. After we completed our emission inventory (2007), we decided to model the information to find where the highest concentrations of emission were going. To do this, we did a few Air Dispersion Models. An air dispersion model is a model that calculates the atmospheric conditions and the emissions together, and then creates a model so you can visually see where the highest concentrations of emissions are. The first step in the model is to enter your atmospheric conditions for that year into the model. From there you need to enter the actual stacks the emisssion come out of and any nearby builings. We utilized a program called AERMOD to do this. Following are an example of a finished product of entering the stacks and building for Conoco/Philips and Continental Carbon(Carbon Black). 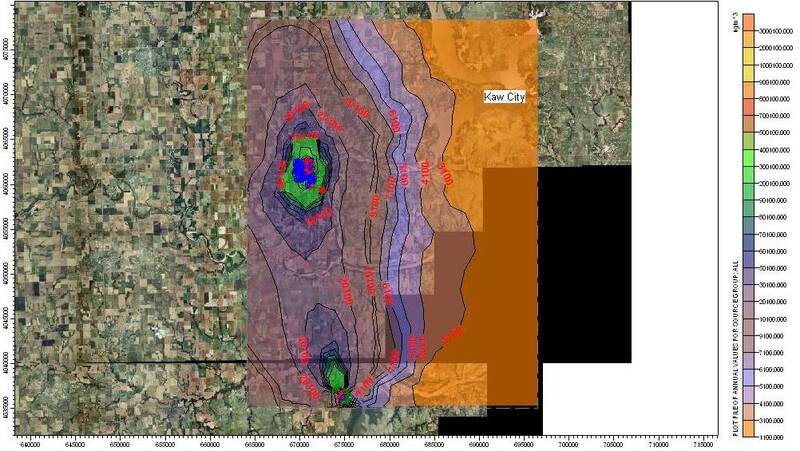 The KNED staff actually enter the information for the three highest pollutors in our area which are Conoco/Phillips, Contential Carbon, and Sooner Power Plant. We ran the model for each individual facility and ran it for all three together. From this information, we were able to get a good idea where most of the emissions were going. KNED is gathering air quality data. We are working on building comparative data. 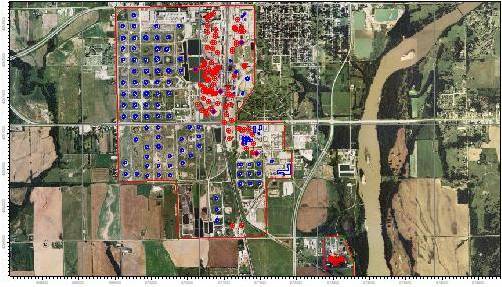 This will allow us to compare the air quality in the Kaw Nation service area with that in other regions. For example, we could see if other tribal nations near power plants or refineries have similar air quality issues. Studying this information will help promote public health and protect the environment.